Digital Tools Rule. You don’t need a CNC machine or become a whiz at making shop drawings on your computer to reap the benefits of digital technology in your woodworking shop. Inexpensive and easy to use digital readout measuring and marking tools from iGaging can immediately add a degree of precision to your woodworking that most people struggle to achieve. And that saves you time, and material, not to mention, the occasional headache. Precise, Absolute Measurements. 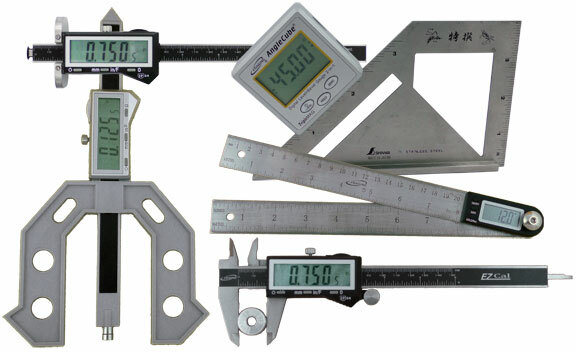 Digital measuring devices, whether they are gauging lengths, widths, depths or angles, display single numeric units as precise as .0005” (one half of one thousandths of an inch) or angle degrees to within .05 (five hundreds of a degree). And with the press of a button you can switch between fractional inch scales as fine as 1/128” or metric to 1/100mm. Large, Single Number Readout Display Screen. Unlike rulers, squares and other measurement tools that rely on engraved scales or your ability to see a crack of light, the readout window on a digital tool displays a large, easy-to-read, single number. It eliminates the parallax problem where viewing, say, the scale of a ruler can be misleading if your line of sight isn’t dead on. With a large digital display, tired or aging eyes or imperfect lighting are no longer an issue when trying to read an engraved 1/32” line on a traditional analog tool. Easy to Repeat Setups. Should you need to reset a machine to make a new project part, the digital measuring tool can always take you quickly back to the precise setting you used before. No More Guesswork, An End To Tedious Trial And Error Test Cuts. When you start using digital measuring tools you’ll end the practice of making test cuts. You’ll no longer need to “sneak up” on a precise setting. You’ll save lots of time and valuable material. You’ll no longer “bump” a fence to dial in the perfect position or make a half-dozen adjustments to get your router bit height just where you want it. Tune Up Your Whole Shop! With just a handful of digital measurement tools you’ll keep your equipment set up just right. You can fine tune your table saw stops at a perfect 90° and 45°. You’ll do the same with your jointer fence, bandsaw table, drill press and miter saw. It’s so easy and so accurate it’s fun! A Few Essential Digital Tools. There are a varietyof digital measuring and marking tools and some of them can be considered multi-purpose. Here are just a few that you will find essential. And best of all, you can put them to work in your shop for $18 to $33 apiece. Amazing Angle Cube. 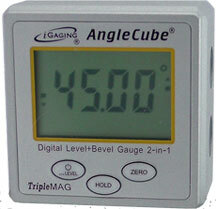 The Angle Cube is a digital angle gauge or inclinometer that reads either actual level or a relative angle between 2 surfaces. Equipped with rare earth magnets on three sides, it will cling to vertical surfaces such as a saw blade or jointer fence, so you can measure the angle between blade and tabletop. The LCD digital display shows the precise tilt of the blade with a resolution of 0.05 degrees. Best of all, while the Angel Cube is on your saw blade it continuously displays the changing blade angle as you turn your hand crank. The Angle Cube lets you dial-in the perfect setting. It’s so easy it feels like cheating! Use the Angle Cube to set up and align most machines in your shop, including your table saw, miter saw, jointer fence, bandsaw and drill press. You’ll find many uses for this handy and remarkably accurate tool. 8” Digital Protractor & Ruler. This tool combines the best of two measuring tools, a set of steel rulers and a digital protractor. The digital readout protractor has a measuring range from 0-360° and features a hold function and a reverse reading capability. You can set angles while transferring measurements. Use handy tool to accurately set your miter saw angle or table saw miter gauge quickly, easily, and with absolute confidence. The stainless steel rulers feature four sets of etched scales: 1/16″, 1/32″ & 1/64″ and mm. 6” Digital Wheel Marking Gauge. Marking gauges are great for layout work because they produce a crisp, fine line. This iGaging digital Wheel Marking Gauge does everything a traditional marking gauge does but adds a significant improvement, the large digital readout display. This tool is a top quality marking gauge with a stout fence, smooth operation and substantial feel. The display displays in 1/64” increments, .0005” or .01mm and easily changes with the press of a button. The display shuts off after 5 minutes of inactivity to preserve the battery. You will find a digital marking gauge to be surprisingly useful. When you know a previous setting you can return directly to it. Knowing the width of a board you can divide by 2 to mark the exact center. For marking out mortises, you can zero the readout at any point, mark one side of the mortise then zero the gauge, move its cutter the width of the mortise and mark the other side of the mortise from the same face. There is no better wheel-marking gauge on the market. This extremely handy tool makes setting up your hand plane or jointer knives fast, precise and dead nuts accurate. Precise plane iron settings are a snap. To set the depth, place it across the blade then adjust it to the setting you want. You can literally watch your adjustments on the digital readout. To make lateral adjustments simply set Plane Gauge on one side of the iron and adjust as needed then repeat on the other side. At the jointer, first set the infeed table so it’s co-planer with the outfeed table. Rotate a jointer knife to top dead center. Now use Plane Check to read the knife height along the length of the blade. Plane Check Is Loaded With Great Features. Its large readout window can display thousands of an inch, hundredths of a millimeter or fractions. The precision, spring-loaded plunger signals the reading. Strong magnets hold Plane Check in place so you can make adjustments using both hands. And Plane Check can be “zeroed out” with the push of a button. Digital Multi-Gauge. 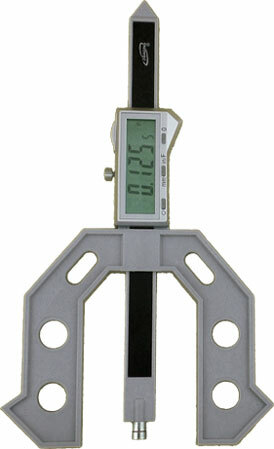 This compact digital gauge measures up to 3″ either horizontal, vertical, or at a 45° angle in mm, inches or fractions. It has a strong, polycarbonate body, large readout display and interchangeable flat and pointed steel ends on the measuring beam. It’s perfect for measuring depth of cut of router bits and table saw blades, or the placement of fences on your router table, drill press or bandsaw. It’s also perfect for measuring the depth of holes, dados, rabbets and grooves. Has a locking feature on the measuring beam and a fractional to decimal conversion chart on the back of the display. The display shows .01mm, .0005in, and 1/64 in reduced to smallest denominator. 6” Digital Vernier Caliper. This caliper has all the features you desire including zero setting, auto off, large display, relative A/B measuring, thumb wheel, stainless steel body, water-resistance and uses a long lasting lithium battery. It even comes with a case and spare battery. Use this rugged tool to measure inside or outside diameters, drill and router bit sizes, thickness of wood, width of a dado, and depth of a rabbet or hole. Measures in increments of .0005”, fractions in 1/128” reduced to smallest denominator and .01mm.